Peter Hall, chief economist at Export Development Canada, left, and Michael Robinet of IHS Markit, preach calm as NAFTA talks are likely. TORONTO -- Keep calm and look for opportunities. That’s the advice of two of Canada’s foremost auto industry watchers for suppliers and others fearful of the threatened cancellation of the North American Free Trade Agreement and other fallout from the United States’ political tumult. But as came clear during Prime Minister Justin Trudeau’s meeting with President Donald Trump last week, Canada appears to be barely on the trade-agreement radar. 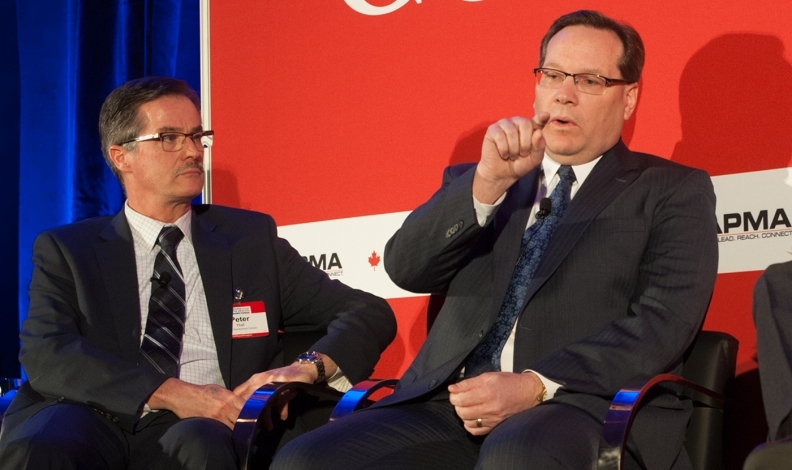 “We do not expect to see the tearing up of deals,” Peter Hall, chief economist at Export Development Canada, told the first Automotive News Canada Congress in Toronto on Feb. 17. This doesn’t mean Canada should stay silent, however. Both analysts urged Canadian auto executives to stress to their American counterparts the costs to both countries of dismantling an auto trade relationship built up over decades. Such costs go well beyond the oft-cited 1.7 million U.S. jobs directly tied to Canada’s car sector, and the key role of Canada in the economies of some 35 states. The U.S. lacks both the production and labour capacity for a major influx of factories, and any attempt to do so would harm financial bottom lines for years and drive up costs for consumers. “There is such a compelling argument to be made, and the best place to make it is at the industry level,” said Hall. What’s overlooked in the political rhetoric, he believes, is the U.S. auto industry’s full recovery following the Great 2008 Recession, something no other sector has achieved. And while many believe sales have plateaued, he notes that job gains in recent months by millennials – the first since the recession – point to sustained economic growth. Robinet said Canadian firms that understand the structure of the North American industry can find opportunities by anticipating the effects of changing technology and product mixes. There’s less value in trying to plan based on broad statements about ending trade deals. The same goes, he says, for the speculation that the Trump government will dramatically dial back the fuel economy requirements that largely dictate the U.S. vehicle mix. “All this idea that regulations are going to be flattened, I think, is Pollyanna-ish,” he told the congress.